As soon as I wrote my article comparing M4A2 engine decks, I knew that I was going to have to do the same thing for the M4A3. Since I am at this moment building two M4A3 kits, I thought it was a perfect time. I know I have a reputation as being a bolt-counter and very hard-nosed about precise scale accuracy. That really is not the case, and in this instance, the reason for making such precise measurements is because I am concerned about kit compatibility. 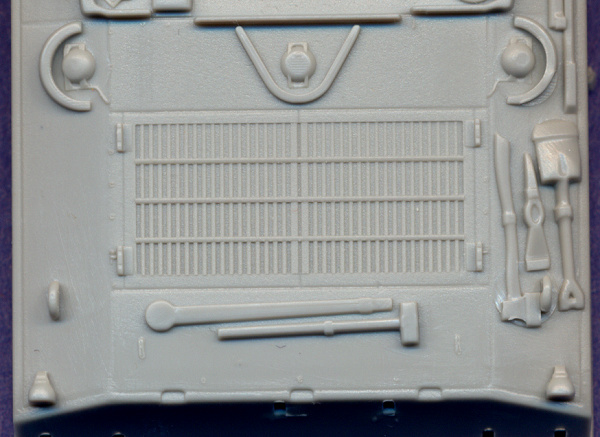 Because some of the engine access grates molded into our plastic kit parts are very shallow and undetailed, I wanted options for replacements. So I am presenting this information for those of you in similar circumstances. 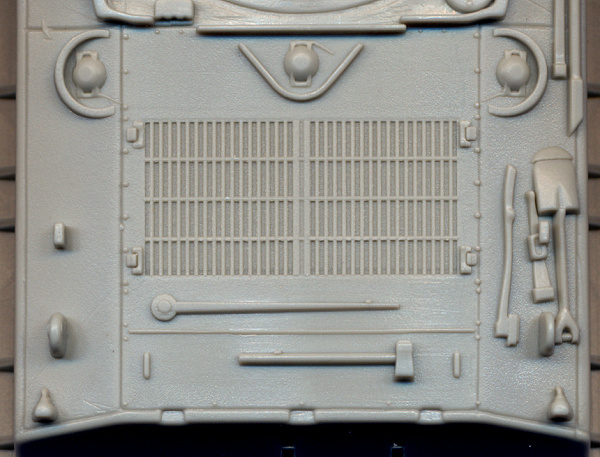 Keep in mind that for me, the overall look of the engine deck is most important, so things like amount and sharpness of detail and molding quality are more important than precise scale measurements. I measured using a steel ruler and my eyeball, so I estimate my margin of error to be within 0.2mm. Several kits were difficult to measure due to thick panel lines. I highlighted in red those measurements that are off 1.0mm or more. I combined the errors for the two measurements for the overall engine deck, and separately for the access grates as a cumulative measure of overall error. 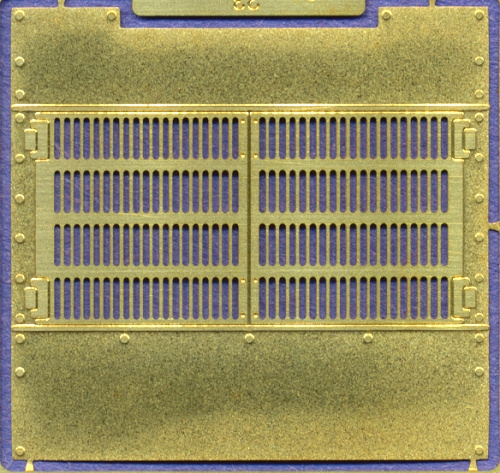 Al.By -1.6 -0.8 2.4 -1.3 -0.3 1.6 Al.By improved the ESCI kit to make this piece, but the access grates remain unchanged. The small differences in errors may be due to my measurements, or changes in size from curing resin. 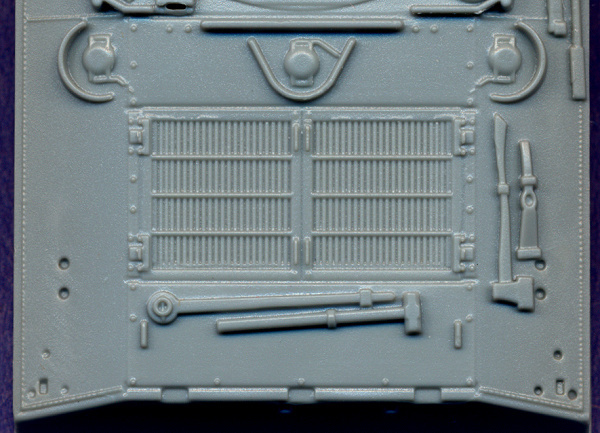 Armourfast -4.5 +0.5 5.0 +0.2 +1.9 2.1 Very heavy panel lines - difficult to measure. Dragon 0 -0.2 0.2 -0.2 +0.1 0.3 Same hull in all M4A3 kits. 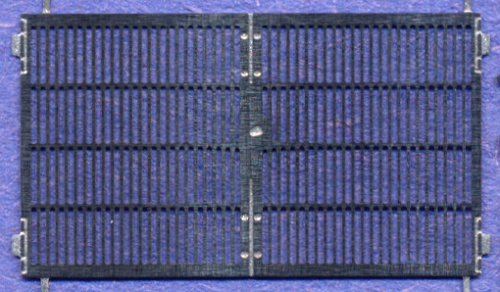 Eduard -0.7 -0.6 1.3 -0.2 -0.3 0.5 Shallow grates; recommend replacement. 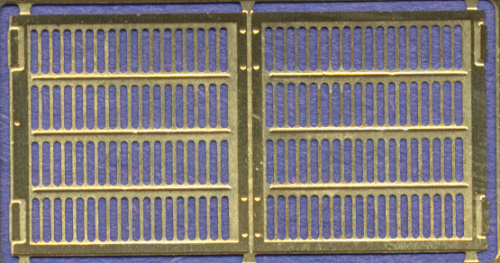 ESCI (Italeri) -1.5 -0.7 2.2 -1.1 -0.3 1.4 Very shallow grates. Highly recommend replacement. Italeri 0 +0.1 0.1 +0.1 +0.8 0.9 This is from Italeri's quickbuild M4A3 kit, not the ESCI re-release. Trumpeter (VVSS) -0.3 +1.5 1.8 -0.2 +1.6 1.8 M4A3 & M4A3 (76)W kits. Trumpeter (HVSS) +0.1 -0.3 0.4 -0.2* +0.4* 0.6 M4A3E8 kits. No lines demarcating access hatch panels, therefore measurement is an estimate. 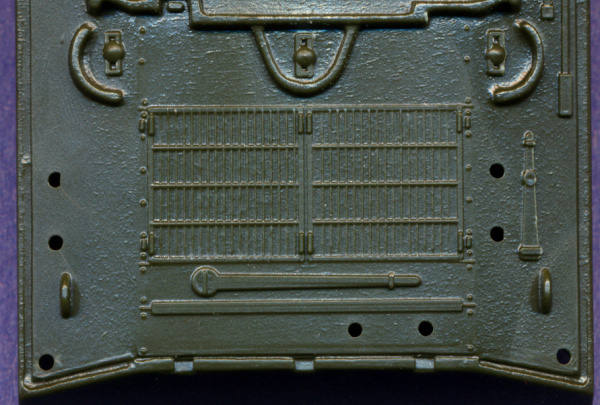 UniModel (M4A3) +0.2 -0.4 0.6 -2.0* +0.3 2.3 This is a very early style of engine deck with a smaller access hatch; it should be 9.5mm tall instead of 11.0, which is reflected in this error measurement. 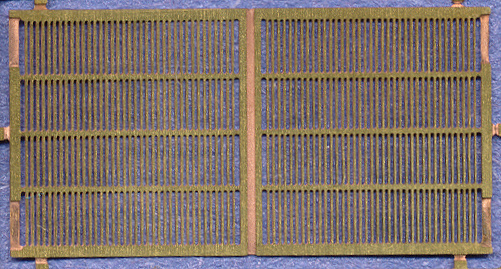 UniModel (M36) 0 +0.5 0.5 +0.3 +0.2 0.5 The dimensions of the M36 deck differ slightly from the M4A3 (but not the grate), and this part from UM measures almost perfect. 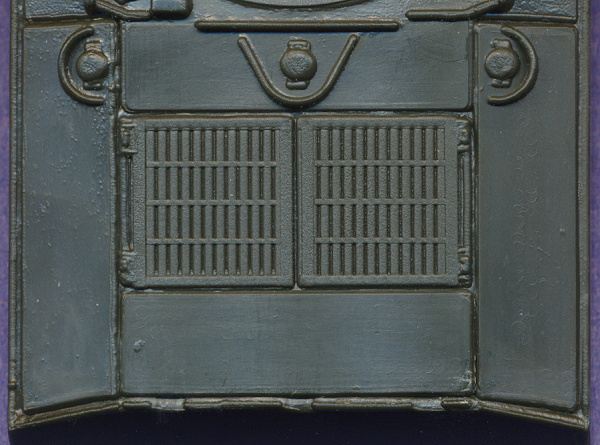 The grate is molded very shallow, and thus an etched replacement part is highly recommended. 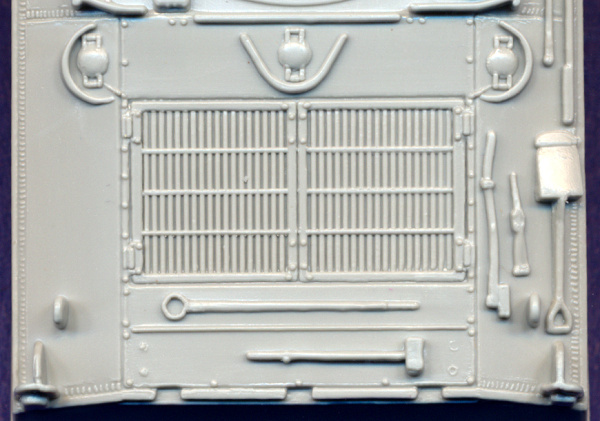 Eduard +1.5 -0.2 1.7 Etched part included in Eduard's Profipack kits, as well as their stand-alone etched detail set. 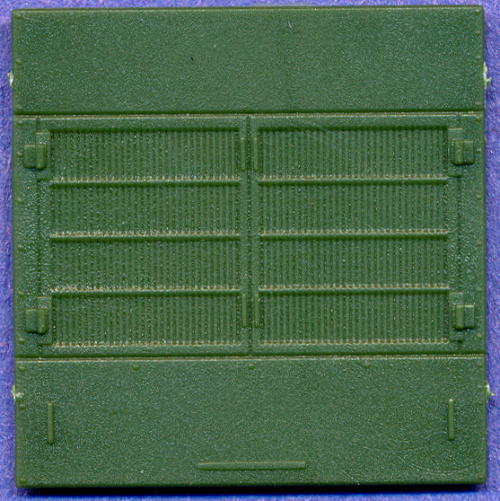 ExtraTech 0 -0.2 0.2 0 +1.1 1.1 Etched part included in M36 Extrapack kits. Hauler +0.5 +2.4 2.9 Intended for the Armourfast kit, its errors are closest to that kit, but could fit others as well. 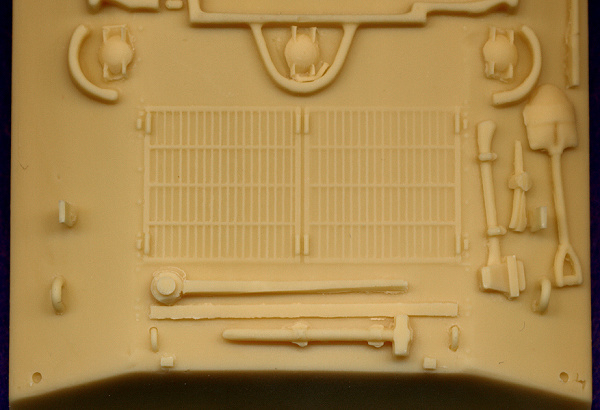 Tracks & Troops -0.4 +0.4 0.8 Much more accurate than T&T's M4A2 grate, this is pretty much a universal replacement part. Although the information above shows many dimensional errors to various degrees, most of them are within acceptable error for me (Armourfast and ESCI being the poorest examples). 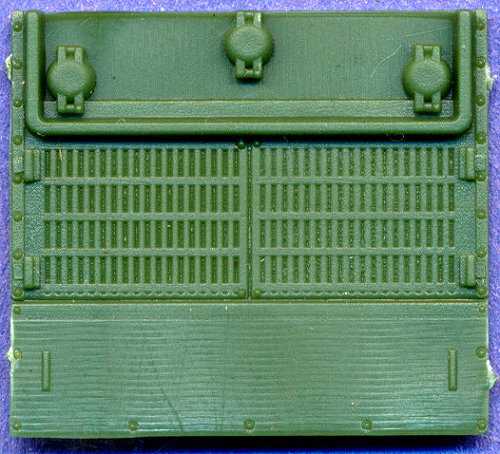 The main problem with the appearance of most of these is the very shallow molding to the slats within the access grates. Do I paint these areas black, and then drybrush across the slats to highlight them? 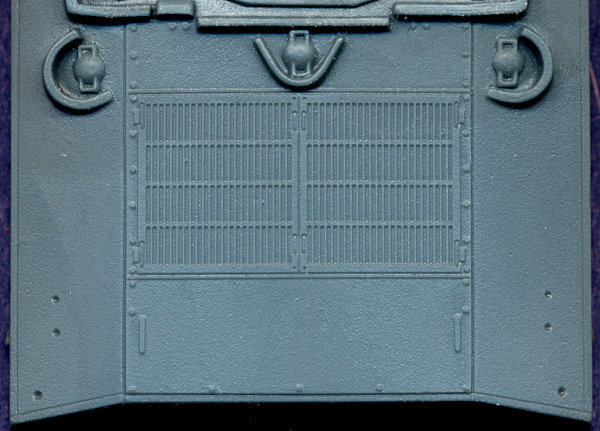 Or do I paint the entire grate the vehicles base paint color and hope that a very dark wash will highlight the slats? This is why etched replacements for these grates are highly appreciated.